My work explores the physical nature of landscape; I am especially interested in the geology of Scotland, its influence on topography and in the concepts of time and process fundamental to the science. I am excited by the evidence in rock of the colossal forces that created and are still re-forming the Earth. These breathtakingly long, infinitely slow geological processes quite dwarf our insignificant human presence. 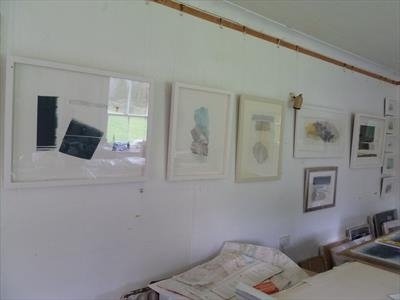 I work in a variety of media including watercolour, graphite, vinyl text, monoprint and oil, and often incorporate graphite rubbings of rock and other natural surfaces. Our experience of landscape, in Scotland especially, is intimately connected with weather, and I am currently engaged on a series of oil paintings reflecting the drama and variety of Scottish skies. Studied drawing and painting with the Open College of Art for seven years before completing a 2 year MFA course with Art Space Nature at Edinburgh College of Art. 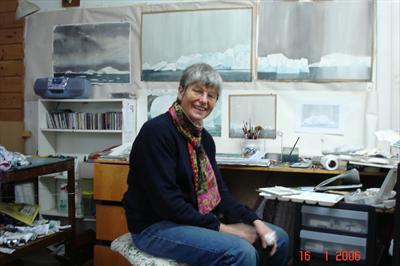 I now work from my studio outside Aberfeldy in Perthshire. 2012 "Connecting/reconnecting", Kings Museum, University of Aberdeen. 2011 PVAF group exhibition "Encounters with time", Threshold art space, Perth. 2011 BBAF Coast Festival group exhibition "Flotsam and Jetsam". 2010-2011 "Avannaa/north" group exhibition, Sermermiut Centre, Ilulissat, West Greenland:BKS Gallery, Copenhagen: Weissraum Gallery, Kyoto, Japan. 2010 "Here(T)here" group exhibition, WASP Gallery, Patriothall, Edinburgh.